There is nothing quite like a coat of paint to lift up the interior of your house. It does not matter whether the house is new or old, we have the experience and the team to bring the interior of your home to life. If you want to impress your neighbour with your painting then our Interior house painting experts can refresh your home, change the look and feel of your house. 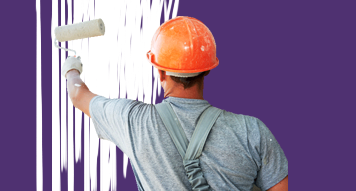 Our house painters work with an approach to meet our client’s budget and needs. We guarantee and insure to deliver 100% job satisfaction to our clients . Whether you are looking to freshen interior space, replace an exterior facade or strip a deck surface, we strive to get the work done on time with fabulous results. Your home is one of your most valuable assets and therefore needs to be maintained and looked after regularly. Our team can accommodate any of our clients needs from painting a single wall or door through to the entire Exterior of a house or unit. Our Professional Particular Painters’s years of service in the painting industry makes us the best contractors to get the job done for you. We have been recognized by our quality residential work and services, so our professional residential painters come highly recommended.